Latissimus dorsi (lat) is a large, flat triangular muscle which is also the widest muscle in the human body. It begins in the lower portion of the back and tapers as it ascends to a narrow tendon that attaches to the humerus anteriorly. Due to which the movements associated with this muscle include extension, adduction and medial rotation of the upper limb. The latissimus dorsi can also depress the shoulder, preventing its upward movement. Latissimus dorsi does not get utilized in day to day activities but is really useful while performing pull ups, chin ups and lat pull downs. The thoracodorsal nerve of the brachial plexus innervates the latissimus dorsi muscle. Thoracodorsal artery is the primary blood supply of the Latissimus Dorsi muscle. Additional small arteries come from dorsal branches of posterior intercostal and lumbar arteries. From lumbodorsal fascia of the lower back, the latissimus dorsi muscle originates, arising from the inferior thoracic and lumbar vertebrae, sacrum, iliac crest, and the four most inferior ribs. To insert on the posterior side of the humerus of the upper arm, latissimus dorsi runs obliquely, superiorly and laterally through the back and armpits. 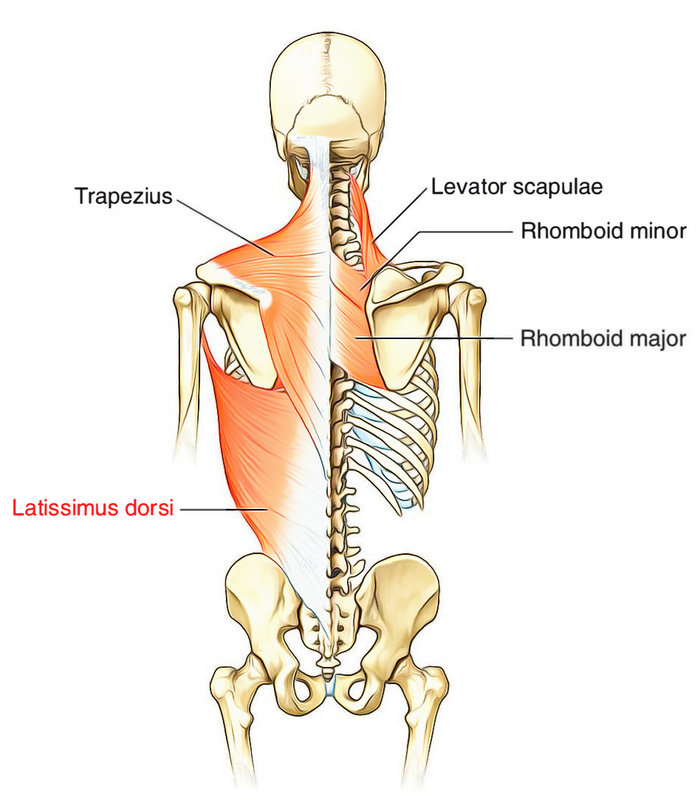 As the latissimus dorsi gets closer to its insertion point, the muscular fibers from its origins merge to a point, defining its triangular shape. Adduction of the arm is the primary function of the lat. Pull-ups, chin-ups or while pulling a heavy object down are perfect examples. Arm extension is another function of the latissimus dorsi for example, doing rowing exercises. The latissimus dorsi is responsible for medial rotation of the arm, moving the front of the arm towards the midline of the body.